Have you ever heard of or tasted sourdough pasta? Exactly! All of our pastas are made with the primordial power of our natural sourdough culture, which we have been using in our sourdough breads for over 20 years. This new invention is named ‘Pasta Fermentata™’. With high quality Canadian ingredients (including natural spring water from our backyard), our fermented pastas have unique characteristics not found in conventional pastas: improved digestibility and nutrient absorption, superior flavour, and very fast cooking time — 5 or 6 minutes for al dente! We’ve plumbed the available scientific research to substantiate our own observations for the benefits of naturally fermented foods. We offer a variety of pastas: 12 different flour combinations available in 6 different shapes! Each flour has a unique flavour and nutrient profile, as well as different characteristics, so you can choose from our more hearty, protein-rich varieties such as the whole grain whole wheat, quinoa, buckwheat, or our powerhouse hemp, or you can try some of our lighter varieties such as our classics, the millet, and spelt clear. 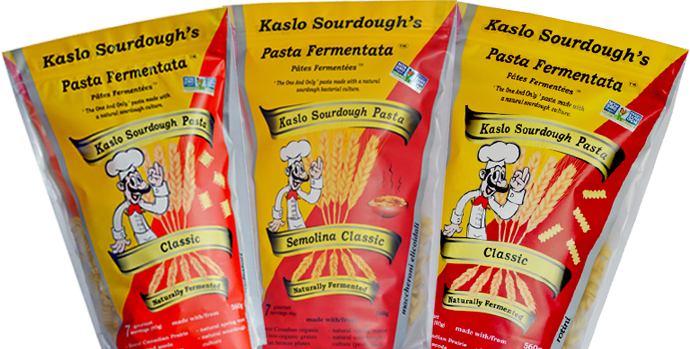 Through trial and error, we have discovered the ideal process for extruding the perfect fermented pasta. We select high quality Canadian grains. We use top-notch Italian machinery and bronze plates. We siphon water from our natural spring in the heart of the Selkirk Mountains. We employ our signature sourdough culture — already used successfully for over 20 years in our sourdough breads. Ninety-five percent of our ingredients are Canadian. We value supporting our Prairie farmers: our high quality durum semolina grain is grown in the hot, dry climate in Southern Saskatchewan and Manitoba.